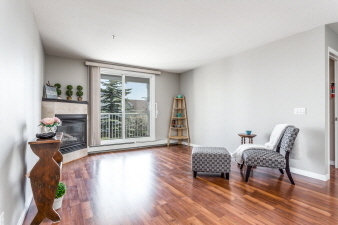 You will notice the pride of ownership from the moment you enter this immaculate 2 bed/2 full bath condo. Recent fresh neutral paint palette, modern laminate flooring and brand new lower kitchen cabinets. Notice the easy access pull downs that are upgraded in 2 of the upper cabinets. Trendy black granite competes the kitchen. The 2 bedrooms/2 baths are on opposite sides of the living space making it the ideal floor plan for roommates. Step out to the east facing deck to enjoy a morning sunrise and coffee. Gas line on the deck makes BBQ’s easy. Lots of storage in the suite from the laundry room to the ample sized closets. Titled parking and more storage in the underground parkade. This condo is located on the quiet east side of the building away from the busy roads and traffic, yet Timmies is a 2 min walk to the west. If you turn east the ridge is just a 4 min walk. Easy access to major routes to down town, South Health Campus or out to the mountains. Welcome Home! Interior Features Fresh Paint, upgraded flooring, new lower kitchen cabinets.